The media seems to be finally getting over the shock of seeing a brown skinned man being in charge – at least they seem to be mentioning that less – and while I couldn’t care two hoots what colour his skin is, its the colour of his politics that I like. Already the man is a breath of fresh air – after the stale and fetid stench of decay and corruption seeping out from under Bush’s sickly administration, its obvious that Obama is capable of bringing hope to many and a new sense of worth to all Americans. 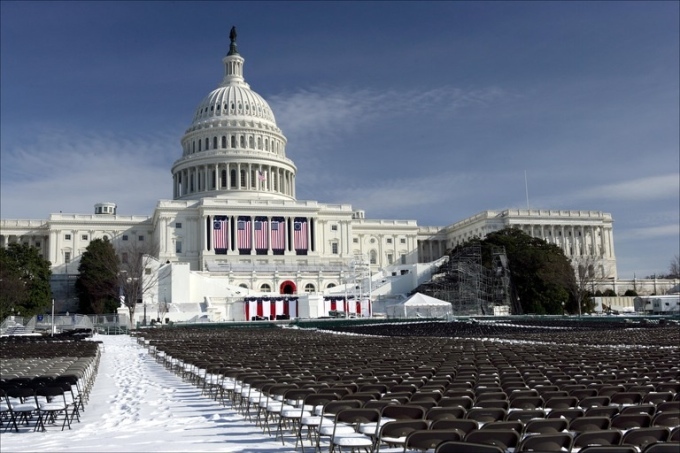 I know he’s had weeks to write the speech, but in terms of oratory, he’s streets ahead of our tired bunch of politicos. I even felt joy and happiness at the prospect of hearing a specially written poem, and listening to a unique composition by some of the world’s most talented musicians, playing outside with their priceless instruments on a cold, almost snowy day, with hope in their hearts. Poetry, classical music, classical white architecture, and a humble black man in charge: what more could you want to start the day right? But what do our pathetic and retarded television commentators decide to do as soon as the Poem is being read, or the music is being played? The pompous ignoramus that is Paul Henry, of our shameful national broadcaster TV One, just blathered on over the top of the proceedings, cut the footage and returned to the studio; and TV3 was not much better. It’s appalling, and bad taste, and shows a dreadful lack of manners and decorum, and also shows that our nation is, at heart, an uncultured beast, if there is no respect for culture in some of its many forms. America, as much as we may mock its arrogance and power and blind allegiance to monster V8 trucks, at least has the ability to commission poetry and music and to take its architecture very seriously. There is a lot that we could learn from that: the least of which is shut up and listen to poetry and music on special occasions. In the mean time, I look forward to the days ahead. Wellington’s architecture, of course, is a very different story when it comes to the staging of mass rallies and speeches to the multitudes. 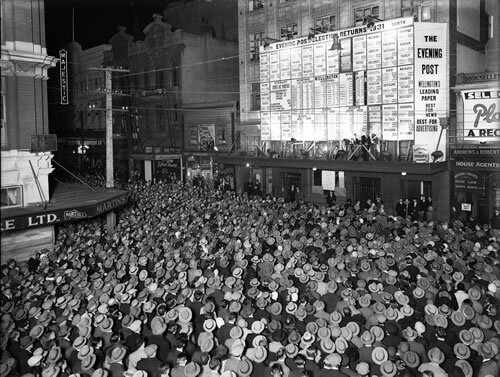 But our streets are large enough for massing of sorts, although now we just do it mainly in front of the TV: in the past, Wellingtonians gathered in front of the newspaper office to see election results for themselves. Washington we are not: there is a small area in front of the Beehive, but it’s not a natural rallying point, and there are plans amongst the Council to enhance the Parliamentary Precinct area to give it more cohesion and more gravitas, but probably not to give it an arena of space suitable for mass rallies. Our smaller population prefers instead to keep to the streets for our Enough is Enough rallies and bi-monthly Lambton Quay protest marches. If you’re reading this for the first time, go and read the comments now, then look at the next two pictures. 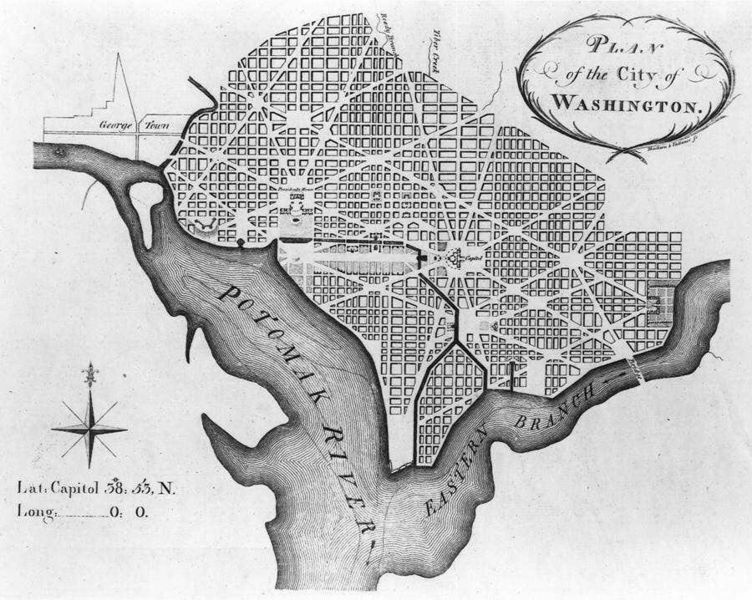 Oh – and big thanks to the Alexander Turnbull and the National Archives. 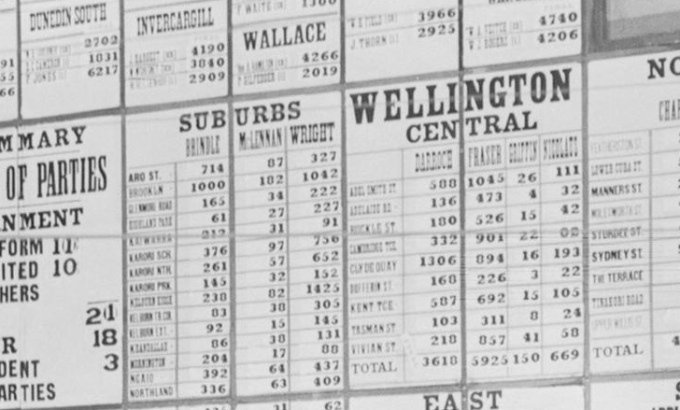 A little close up of some of the voters for you – and also a glimpse at what they’re voting for in the 1931 Election in Wellington. At this stage of the evening, United and Reform parties had 21 seats between them, and Labour had 18 seats sewn up. United and Reform went on to win the evening (thanks for the link Matt), and by the look of it, Fraser made a clean sweep of it in Wellington Central. But really, the most interesting thing about the photo is the very low number of women in the photo (up above) – it is as if women were not allowed to be interested in politics. Surely that must be a huge change to the Obama pictures above – where the tv crowd footage seemed to be more evenly split. 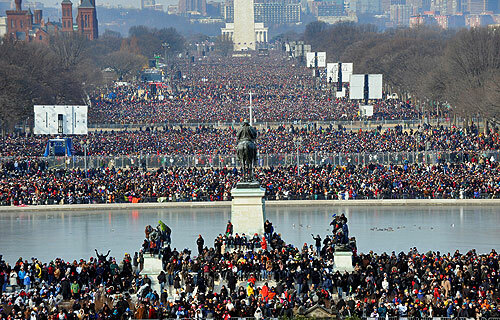 Where did you get that awesome picture of the crowd of Wellingtonians with hats from? It is great, isn’t it. Don’t know how they got their hats to stay on their heads in those days, as allegedly the wind was a lot stronger. It’s from an archive, but I’ve forgotten which one. Probably the Evening Post archive, via the National Archive website i think, but I found it a couple of years ago and have lost the link. Try the Timeframes search engine at the Natlib. http://timeframes.natlib.govt.nz. Here�s the photo, and there are others in the archive. I was going to comment on how similar everyone looks, but I suspect that 70 years from now, our decendants will say the same about us. Re TV commentary – I wonder if this is because NZers are so used to it with sports commentary. We can�t just watch (or read a caption) – we have to have every last minute filled in with a description of what�s happening and some trivia facts thrown in. Re public spaces – I rather like how Wellington�s capital spaces have sort of evolved with strong influence from the landscape, rather than being laid out by a L�Enfant or a Burley Griffin. The snaking Lambton Quay is a far cooler grand route to Parliament than any boulevard created by a designers ruler. “why is cheese delicious on Italian food, but when you melt it on Chinese food it’s disgusting”? OK, so I posted the links, which haven’t appeared – so I suspect a moderation filter is at work here…? 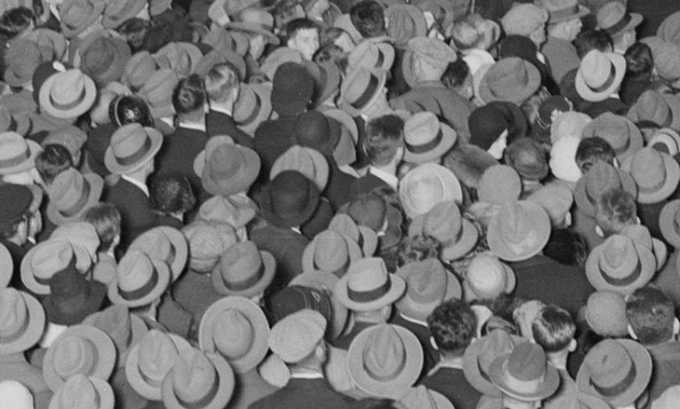 If the hatty-crowd image was by William Hall Raine, and he died in 1955, is the image in the public domain http://bit.ly/11I8E ? Should be sitting on http://en.wikipedia.org/wiki/New_Zealand_general_election,_1931 too I reckon. Of course hats were popular back then. It was before the invention of shampoo. Every day was a bad hair day. Yes, Robyn’s link is the correct one – thank you Robyn, and most of all, thank you to the Alexander Turnbull Library for putting such a great image on line. Its actually so much better viewing it on their site, as you can zoom in to an unimaginable degree. In fact, I think I’m going to have to stick some of the blowups in for you to have a look at. Hold on a sec till i figure this out…. Right – extra images added. Thanks Matt and Robyn and M-D for your great links and helpful advice. Sidenote, it was not em who found the image on Alexander Turnbull website, it was Robyn.